The perfect morning breakfast toasts! 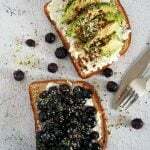 Savory avocado toasts with a hint of heat and the sweet and juicy blueberry toasts are the perfect breakfast combination. Toast your bread slices. Spread 2 tbsp of ricotta on each of the bread. For the avocado toast, arrange the avocado slices over one bread slice. Crack black peppercorns over the avocado. Sprinkle with pepper flakes. Sprinkle a pinch (or more, if preferred) of salt. Drizzle with olive oil. For the blueberry toast, arrange the blueberries over the ricotta on the other bread slice. Sprinkle a pinch of salt. Drizzle honey over top. Sprinkle hemp seeds over the toasts. Enjoy.